The Waterford Graded School District will contract with Aramark this year to provide food management services for the 2016-17 school year. Each student is issued a personalized identification number (PIN) that he/she uses to access a computerized lunch account. Lunch prices for the 2017-18 school year will be: 5K-6 is $2.70 (only one price for elementary grades) and 7-8 is $2.85 per ticket. 5K—8th Grade Breakfast = $1.60. Milk is included in all hot lunches and extra milk may be purchased at the cost of $0.35. (All prices subject to change at time of publication) Please mail or drop off at your child’s school a check for the family’s lunch money prior to the start of school or at the Open House/Orientation. Keeping a healthy balance in your child’s lunch account is appreciated. You can access you child’s lunch account balance through Family Access. When a student’s account is empty, we cannot “charge” a lunch. 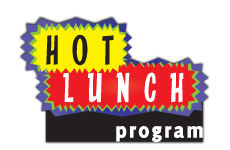 The hot lunch program does not allow the school district to provide a lunch if it is not paid for at the point of service. The school district will provide your child something to eat but in many instances, this is embarrassing for the student. Again, it is very important that you remember your family must have money in your family’s lunch account before your child can use the lunch program at school. We want all students to be able to take part in our quality lunch program. By establishing an amount in the lunch account prior to the school year, please add to it on a monthly basis or as routinely as possible so your account is continually funded. Kindergarten Milk: The kindergarten teachers and the administration would like to offer milk as a beverage choice during snack time. We feel that milk is a nutritious choice for our students and would like to give parents the opportunity to provide milk at snack time. This is an optional program and we do not expect all students to participate. Students who do not receive milk may drink water. Students whose parents choose milk for them will have the opportunity to daily choose chocolate milk, 2% white milk or skim milk. The cost of milk will be included in a letter given out by your child’s teacher. Food Allergies: Schools may make food substitutions, at their discretion, for individual children who do not have a disability, but are medically certified as having a special medical or dietary need. This would include children who have food intolerances or allergies but do not have life-threatening reactions when exposed to the food(s) to which they are allergic. When food allergies may result in severe, life-threatening (anaphylactic) reactions, the child’s condition would meet the definition of “disability” and the substitutions prescribed by the physician must be made. The medical statement must include: an identification of the medical or other special dietary need which restricts the child’s diet, the food or foods to be omitted from the child’s diet and the food or choice of foods to be substituted. A medical form is available in the district office. Free and Reduced Lunch: Applications for free and reduced lunch are available to children whose families qualify under the income scale and eligibility guidelines established by the federal government. Applications for free or reduced lunch may be obtained from any of the school building offices starting in the middle of August. We would appreciate the application being completed and returned to the school office prior to August 21st if parents want free or reduced lunches available on the first day of school. Mail or drop the application off at your child’s school. The application is also available online as an optional step in the online registration. Individuals participating in the free and reduced lunch program during the past school year are required to complete a new application each year. Questions regarding the program should be directed to the building office staff.